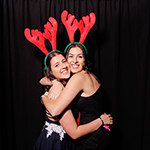 In the Booth has been providing Melbourne and Yarra Valley Photobooth Hire since 2010. We’ve had the privilege of providing photo booth hire for weddings, parties, corporate functions and gala events at some of the most stunning locations in Victoria. Our gorgeous booths retain the classic and timeless charm of a bygone era, whilst providing our guests with the latest in digital technology and highest quality imagery. Guests receive the classic keepsake of instant prints to stash in their wallet or display on the fridge, along with the ability to share instantly on any social platform through our free integrated photobooth app. The Yarra Valley and Melbourne’s eastern suburbs host some amazing venues for your special event and photobooth hire. Just some of the locations we have provided photo booth’s from include Bram Leigh, Butleigh Wootton, Carousel, Encore St Kilda, Immerse, Leonda, and Stones of the Yarra just to name a few. We’ve also had booths at some beautiful venues in the Mornington Peninsula. If you’re planning an event anywhere across Melbourne’s eastern side, we have your photo booth hire sorted! Tom and Narelle are proud to call this part of the country home and love providing photobooth hire for any event you are considering. Hi, we’re Tom and Narelle! We first experienced ‘In the Booth’ at our wedding in the Yarra Valley. We wanted a fun atmosphere and to make our wedding an even more memorable occasion. We loved the experience so much we wanted to be part of bringing the same to others, and are now thrilled to be running In the Booth ourselves and providing photobooth hire throughout Melbourne’s Eastern suburbs, the beautiful Yarra Valley and beyond. When we’re not out boothing, we are busy spending time with our family and catching up with friends. Narelle also loves spending time with our four-legged friends (horses and dog), and when there’s time Tom is a frustrated golf hack who green thumbs and works on those never ending Man Cave projects. At weddings, parties and corporate events we see the booth bring smiles and laughter. Guests are sometimes shy at first, but as the confidence grows they return again and again collecting more wonderful memories. Get ready for some unreal moments, plenty of giggles, and the joy of capturing precious moments that may otherwise be lost. We look forward to working with you to make your event even more amazing. For Melbourne East and Yarra Valley photo booth hire enquiries please contact us anytime. "We can't thank you enough for everything! Everybody had so much fun in the booth, and now we have photos we can cherish from our special night! Sam (the staff attendant) was fantastic! Thanks again for everything :) We will definitely be referring you guys to family and friends. Kind Regards,"
"We LOVE LOVE LOVE your service..... We almost didn't bother with a photobooth/guest book at our wedding because there was so much going on during the planning stages, we didn't think we could be bothered. We organized your service last minute - thank goodness you were still available and seriously it was the best thing we did! And we have received the USB folio in the mail today - love it, THANKS!" "Hi guys, Could you please pass on my thanks for the artwork which looked absolutely fantastic which the team were very impressed with. Could you also pass on my thanks to ever one at your end who was involved and especially our attendant Sam who did a first class job looking after the team. 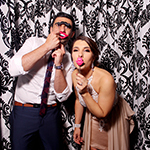 The photo booth was a great idea which we will do again." What is it you love about providing photo booth hire in Melbourne East? 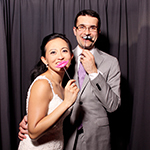 Knowing firsthand the fun and excitement a photobooth brings our clients and their guests. Having had In the Booth at our own wedding, we saw how much our guests absolutely loved it. You only get one shot at capturing memories at a wedding or other special event, and we're so glad we did this in such a relaxed and entertaining way. Guests at photobooth events often ask if they can get digital copies of their photos. With our free mobile app the answer is a very easy yes! Guests can have instant access to their images without needing any social media accounts or having to enter their email addresses. Images are saved straight to their mobile for safe keeping or sharing with the world. It sounds corny but try and enjoy the journey as well as the event. Whether you're super-organised or last-minute, there are always going to be things that may not go to plan or cause you stress. If you can see these as challenges to be overcome and stay relaxed, the whole process will be far more enjoyable. Of course we're biased because it's our neck of the woods, but visiting the Yarra Valley has to be on your to do list. We have some of the most magnificent wineries offering world class wine, great food and some spectacular views. Spoil yourself with a day in the Yarra and you won’t be disappointed.